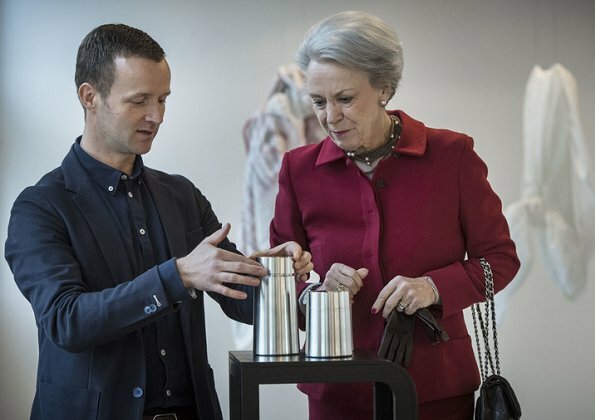 On December 2017, Princess Benedikte of Denmark visited "Design Collaborations Japan - Denmark 150 years" exhibition held at Gallery A. Petersen Collection & Crafts in Copenhagen, Denmark. The Design Collaborations exhibition show new designs by Lars Vejen created in close collaboration with selected Japanese and Danish craftsmen - all handicrafts with roots in traditional crafts, skills and cultures. Chic as always, and best dressed out of tree sisters! Better than Margrethe, yes, but we don't see Anne Marie often enough to compare. Yes, she is always very well dressed. I think, Princess Benedikte has an education/diploma in design and tailoring …… just like Queen Sonja, but I'm not sure ?